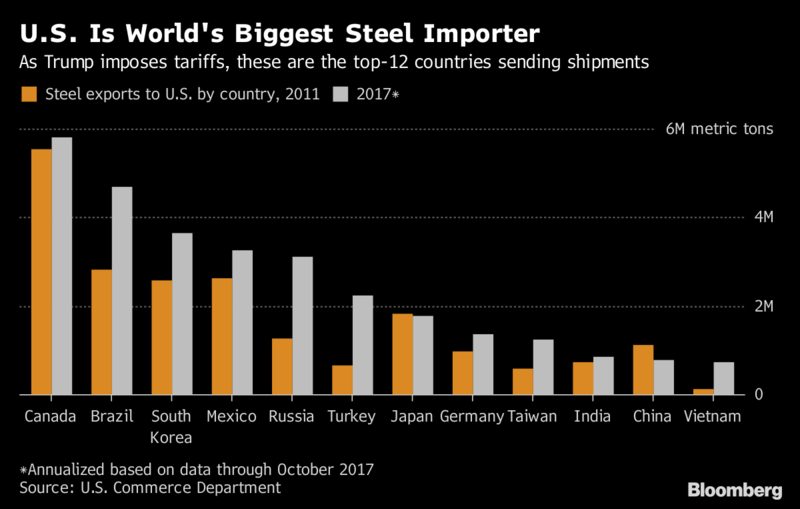 Trump tariffs have helped make U.S. steel prices among the highest in the world. That swells the bottom line of domestic producers such as Nucor Corp. and U.S. Steel Corp. as well as benefiting the U.S. plants of foreign companies like ArcelorMittal. And while Canadian and Mexican producers are subject to tariffs, Brazilian rivals aren’t. That’s helped push up shares in Sao Paulo-based Gerdau SA by 22 percent this year. So successful have tariffs been in pushing up American steel that foreign metal is becoming more appealing. And Phil Gibbs, a steel analyst at KeyBanc Capital Markets, says demand destruction is a real concern, with consumers potentially reconsidering orders. Tariffs look set to squeeze margins for automakers, which may encourage them to shift operations and even materials, says CRU aluminum analyst Doug Hilderhoff. One possibility is that car makers reconsider plans to increase their use of aluminum and stay with steel. Hilderhoff also says original equipment manufacturers could move to Mexico or Canada, where they can import aluminum without a tariff and turn it into finished goods that can be shipped into the U.S. without being taxed. Few industrial metals have been left unscathed by tariffs, sanctions and the uncertainty of how long they will last. A month ago, copper was flying near four-year highs as investors looked toward a tightening market. But as fears grow that tariffs will erode global growth, copper and other metals capitulated. The pullback has come just as producers were starting to move forward on expansions after emerging from a painful downturn. As prices retreat, the industry may start to question its newfound largess and batten down the hatches once again. Trade conflicts between the U.S., its allies and China, and threats of tariffs on U.S. auto imports, have thrown a wrench into metals used in rechargeable batteries. Few epitomize how quickly the sands are shifting more than Glencore Plc. 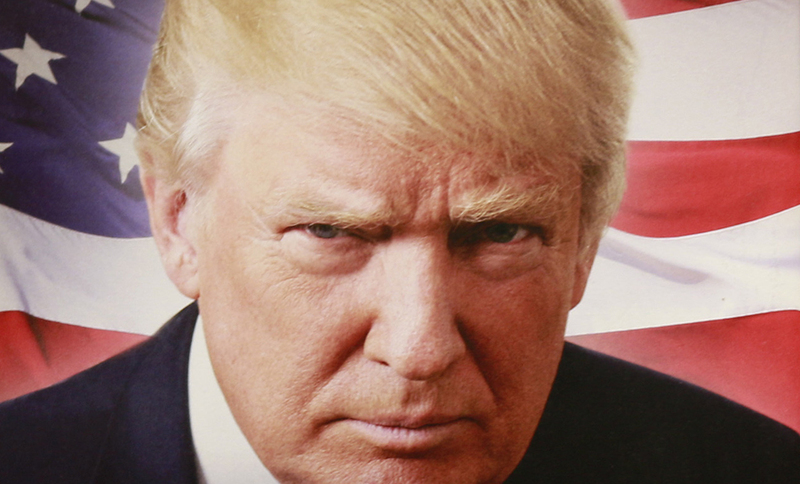 One of the most adept companies at navigating tough environments, the giant trader and producer is now dealing with tariffs in various forms, as well as a long list of supply shocks, including sanctions and resource nationalism. In April, CEO Ivan Glasenberg had to quit the board of one of Glencore’s biggest aluminum suppliers, United Co. Rusal, after it was hit with U.S. sanctions. Glencore also has taken steps to get around U.S. sanctions in the Democratic Republic of Congo while fighting a new mining code there. This week, U.S. authorities demanded documents relating to possible corruption and money laundering. While China is the main focus of Trump’s trade push, other countries are moving to prevent dumping. The European Union said it will impose curbs on foreign steel to prevent being flooded with shipments diverted away from the U.S. Canada is said to be making similar plans. The tariffs also are forcing Asian nations to erect barriers. That means fewer markets for surplus steel from China where demand will continue to soften, according to Bloomberg Intelligence metals analyst Andrew Cosgrove. While that suggests tariffs will succeed in addressing Chinese oversupply, it also means prices in other countries will be higher, hurting manufacturers, he said. The Rusal sanctions, combined with disruptions in Brazil, inflated prices of alumina, the main ingredient in aluminum. That pushes up costs for smelters that buy alumina and provides incentives for those that make their own, such as Alcoa Corp., to sell more on the market and feed less to their own smelters — not what Trump would want to hear as he tries to revive idled U.S. plants.